An analysis of South Asia’s biggest cities found that if current warming trends continued, wet bulb temperatures — a measure of heat and humidity indicating when the body can no longer cool itself — will become so high people directly exposed for six hours or more would die. She had traveled for 26 hours in a hot oven of a bus to visit her husband, a migrant worker here in the Indian capital. By the time she got here, the city was an oven, too: 111 degrees by lunchtime, and Rehmati was in an emergency room. The doctor, Reena Yadav, did not know exactly what had made Rehmati sick, but it was clearly linked to the heat. Yadav suspected dehydration, possibly aggravated by fasting during Ramadan. Or it could have been food poisoning, common in summer because food spoils quickly. Yadav put Rehmati, who is 31 and goes by one name, on a drip. She held her hand and told her she would be fine. Rehmati leaned over and retched. If global greenhouse-gas emissions continue at their current pace, they say, heat and humidity levels could become unbearable, especially for the poor. Indeed, a recent analysis of climate trends in several of South Asia’s biggest cities found that if current warming trends continue, by the end of the century, wet bulb temperatures — a measure of heat and humidity that can indicate the point when the body can no longer cool itself — would be so high that people directly exposed for six hours or more would not survive. For the country’s National Disaster Management Agency, alarm bells rang after a heat wave struck the normally hot city of Ahmedabad, in western India, in May 2010, and temperatures soared to 118 degrees Fahrenheit: It resulted in a 43 percent increase in mortality, compared with the same period in previous years, a study by public health researchers found. Since then, in some places, local governments and the Natural Resources Defense Council, an advocacy group, have put in place simple measures. In Ahmedabad, city-funded vans distribute free water during the hottest months. In the eastern coastal city of Bhubaneswar, parks are kept open in afternoons so outdoor workers can sit in the shade. Some cities that had felled trees for construction projects are busy trying to plant new ones. The science is unequivocally worrying. Across the region, a recent World Bank report concluded, rising temperatures could diminish the living standards of 800 million people. Worldwide, among the 100 most populous cities where summer highs are expected to reach at least 95 degrees Fahrenheit by 2050, according to estimates by the Urban Climate Change Research Network, 24 are in India. 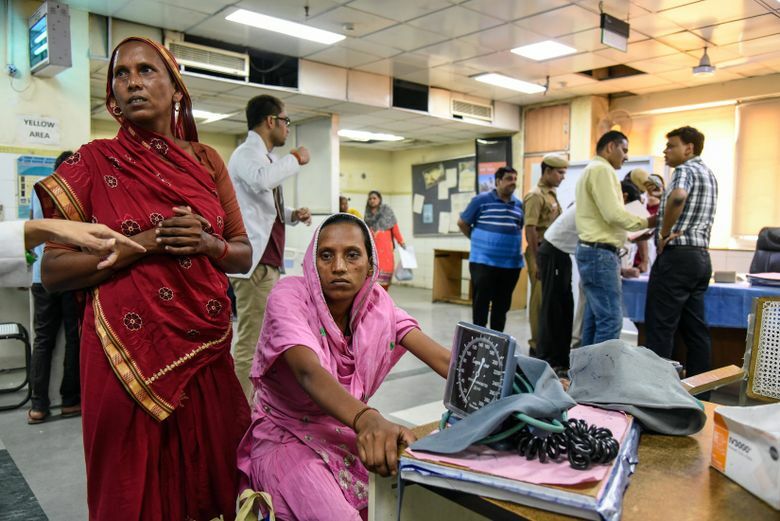 On a blistering Wednesday morning, with the heat index at 111 degrees, he and a team of survey takers snaked through the lanes of a working-class neighborhood in central Delhi. They measured temperature and humidity inside the brick-and-tin apartments. They spoke to residents about how the heat affects them. “Only by 4 a.m., when it cools down, can we sleep,” a woman named Kamal told him. Her husband, a day laborer, suffered heatstroke this year, missing a week’s work — and a week’s pay. A shopkeeper named Mohammed Naeem said that while he managed to stay cool in his ground-floor space, his father’s blood pressure rose every summer, as he sweltered in their top-floor apartment all day. A woman named Abeeda told Magotra that she helped her husband cope during the summer by stocking glucose tablets in the home at all times. Her husband works as a house painter. Even when he is nauseated and dizzy in the heat, he goes to work, she said. He cannot afford not to. Across town, workers covered their faces with bandannas as they built a freeway extension for Delhi’s rapidly growing number of cars. The sky was hazy with dust. Skin rash, dry mouth, nausea, headaches: These were their everyday ailments, the construction workers said. It got so debilitating that every 10 to 15 days, they had to skip a day of work and lose pay. Worldwide, by 2030, extreme heat could lead to a $2 trillion loss in labor productivity, the International Labor Organization estimated. In Hyderabad, a similar effort is being tested. A pilot project by a team of engineers and urban planners covered a handful of tin-roofed shacks with white tarpaulin. It brought down indoor temperatures by at least 2 degrees, which was enough to make the intolerable tolerable. Now they want to expand their cool-roof experiment to a 1-square-kilometer patch of the city, installing cool roofs, cool walls and cool sidewalks, and planting trees.